HomeFantasy Flight GamesStar Wars: Legion announced! There are a handful of things in this world that I would say I am very passionate about. Hell, if you’ve perused any of my articles on this website you can sum a couple of these up right off the bat. That would include tabletop gaming and Star Wars. Could you imagine if infantry-focused tabletop combat was brought into the fold of the Star Wars universe? Imagine no longer, it is here! In the form of the rather tantalizingly named Star Wars: Legion. The game is summarised as battles lasting six rounds in which your units must claim objectives in order to secure victory. The use of command cards can determine who gets to go first along with delivering orders for your units. It seems the movement of units will be determined via a movement tool provided in the game (akin to X-Wing, perhaps?) with each unit having its own movement speed. It’s mentioned that the unit leader moves first with the other models in the unit following suit, which sounds somewhat natural as that’s typically how I would expect squads to act. Combat is claimed to be streamlined based on the weapons held by units as seen on their unit card. During attacks you pick a weapon for each miniature to form a dice pool of attacks. You then roll them for attacking, the opponent rolls to defend and from this damage can be deduced. It’s made clear on their site that the game is designed to be fast-paced. But what about the box? The goods? That sweet, sweet plastic? What’s in the box?! Well, I’m glad you asked! 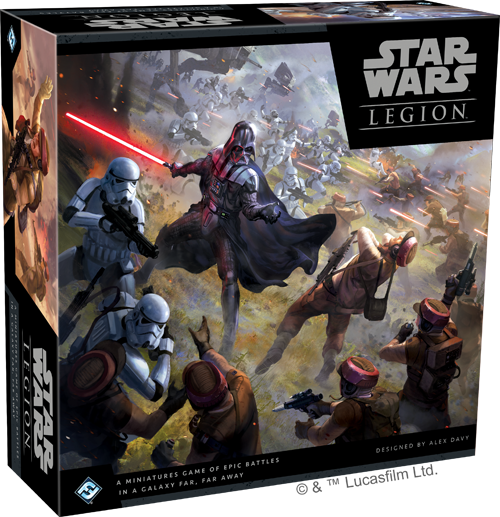 “With thirty-three unpainted and easily assembled miniatures, and all the cards, movement tools, tokens, and terrain that you need for battle, the Star Wars: Legion Core Set is the perfect way to bring Star Wars battles to your tabletop. I’m very, very curious about the terrain they’ll be including, surely we’ll not be getting some wonderfully details Mos Eisley huts or Endor bunkers in the box?! As stated the miniatures come with some assembly required and come unpainted. For a range of 33 miniatures that’s not going to raise any eyebrows of veteran wargamers, I don’t think. Though, I wonder if it might just be enough to scare off anyone fresh to the hobby with Legion being the first fray they wade in upon. Though, as if this is something FFG are aware of, a painting tutorial is already on YouTube and it seems rather informative, even for someone who’s been painting for some years! It’s not under the FFG channel but I can’t imagine they aren’t involved in this in some way. Now…price. The FFG website has the box coming in at $89.95. It’s a little high but I wonder how much of that is customers paying for the brand, let alone the contents. It’s not an absurd cost for a starter box compared to others out there. I reckon punters might not be willing to jump wildly into the gambit before seeing some actual gameplay itself. Plenty more details can be found on the FFG website here, but I’m going to hold out for some previews and hands-on experiences with the game first. With the game being demo’d at Gencon right now, I foresee videos on YouTube imminently if not already. Star Wars: Legion is due to release early 2018. What are your thoughts? Are you excited to oversee the Galactic Civil War? Will you be commanding the Rebels or the Galactic Empire? Let us know your thoughts and as always you can support us and our content via our Patreon and stick with us on Facebook for all the latest and greatest.